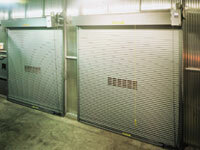 Commercial garage doors are much different than residential doors, frequency of use being the most common difference. Whereas a residential door only gets used two times per day, on average, a commercial door may be used several times per hour. Crown works with only the best commercial door manufacturers to offer their customers the finest products the industry has to offer. Please call for a your free estimate today!